Article first published as TV Review: STAR TREK: DISCOVERY on Seat42F. SPOILER ALERT: Towards the end of this review, I do talk about the events of the second episode, available only on CBS All Access, where the rest of the series will be released. I’ve been a Star Trek fan since I was a child. I asked my dad to pick up Star Wars at the library for me, and he brought me Star Trek: The Motion Picture instead. Widely regarded as a weaker film for the franchise, it was still plenty enough to get me hooked, and I devoured most of the episodes and movies made, usually many times over. Today, I co-host the re-watch podcast It’s All Been Trekked Before and still eagerly look forward to any new material from the title. Hence, I was super psyched for last night’s premiere of STAR TREK: DISCOVERY. Thankfully, it lived up to the hype. STAR TREK: DISCOVERY stars Sonequa Martin-Green (The Walking Dead) as Commander Michael Burnham, first officer on the U.S.S. Shenzhou. Raised by Sarek of Vulcan (James Frain, Orphan Black) after her family was killed in a Klingon attack, Burnham returns to humankind under the command of Captain Philippa Georgiou (Michelle Yeoh, Crouching Tiger, Hidden Dragon), who helps her find her humanity and emotion. When the Shenzhou runs into a new sect of Klingons trying to unite the 24 houses of the empire, emotional and physical battles erupt. This spin-off is set in the same familiar universe of most Star Trek (aside from the most recent films, which take place in an alternate timeline), and that is apparent. The ideals and diversity and mission feel the same. Uniforms and ship design and aliens match up with what we’ve seen before. The crew is heroic and dedicated. What’s different is the complexity. From the stunning designs to new special effects, STAR TREK: DISCOVERY looks cinematic and larger-scale than any other Star Trek television show, and all of the older movies, too. This matches the character development, which is much more central, driving the story. The tale itself is serial, and the pacing a lot slower than any previous part of the franchise. So this is the grown-up, modern, better version of the universe, with clear influence from co-creator Bryan Fuller (Hannibal), who is sadly no longer with the show. Lest you think that makes it a stark departure from traditional Star Trel, I would argue that it isn’t. Serial storytelling was explored in Star Trek: Deep Space 9, my favorite of the spin-offs. (It’s too early to rank this one.) Voyager and Enterprise, which came after DS9, were less so, but did retain some of the ongoing elements. The more episodes that are made, the more we got into the makeup of the species and characters. And Burnham is sort of echoing Commander Sisko from Deep Space 9 with her tragic backstory and the battle we witness in the first two installments. So STAR TREK: DISCOVERY builds upon what’s come before without going too far off the rails. That being said, there are some mistakes or stretches in the continuity. For instance, the delta insignia worn by all Starfleet officers is not appropriate to the time, as in the Original Series (set ten years later than the newest incarnation), each starship had a different logo. 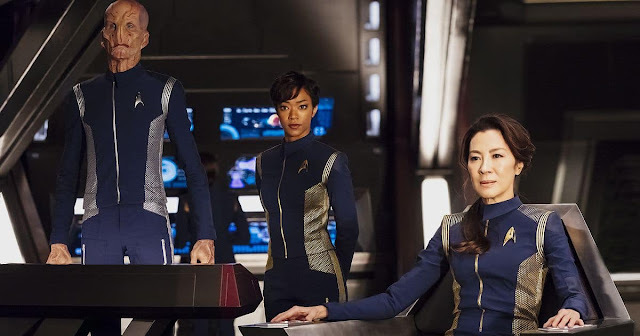 The uniforms and bridge layout pull from Enterprise more than the Original, even though STAR TREK: DISCOVERY is a lot closer in time to the Original (though it is said that the Shenzou is an older ship). It’s possible, but unlikely, that Burnham and her history with the Klingons wouldn’t have ever been mentioned by Spock, even though she was apparently raised by Spock’s parents when she wasn’t much older than he was. And the Klingons feel pretty different than those in the original, not just in look, but in culture, too. Some of this could be explained away, and I hope it is. Under the leadership of T’Kuvma (Chris Obi, American Gods) and Voq (actor not revealed, despite getting a character poster), the Klingons are likely to undergo a dramatic shift as a species. If STAR TREK: DISCOVERY is partially about how the Klingons become the Klingons we know, that would be neat. And maybe the Spock stuff will be explored, too. Given how well made this series is, I am willing to give them the benefit of the doubt for now. Besides the Klingons, STAR TREK: DISCOVERY has a lot of other cool alien species. The most prominent non-human is Lt. Saru (Doug Jones, Hellboy), the Kelpien science officer of the Shenzhou. He is biologically prey, which means he isn’t as bold as some other crew members. But in Jones’ hands, he’s also a very interesting personality who I hope will continue to appear. So here’s where we get spoiler-y. The first episode, which aired on CBS, is only half of the original pilot, ending in a massive cliffhanger. Which is smart if they want to force Star Trek fans to purchase CBS All Access, the network’s way-overpriced streaming service where the rest of the episodes will be released. The second half of the pilot was made available last night, too, and was quite shocking, ending with the deaths of both T’Kuvma and Captain Georgiou, and the destruction of the Shenzou. This changes the direction of the show entirely, which makes since, given that Yeoh is listed as a ‘special guest star’ and we haven’t even met some of the show’s leads, like Captain Lorca (Jason Isaacs, the Harry Potter films) and Lt. Stamets (Anthony Rapp, Rent). However, what that means is that these two hours are basically Sisko at the Battle of Wolf 359, a small part of the DS9 pilot, elongated and enriched. Burnham, stripped of her rank and sentenced to life in prison, has a very challenging hero’s journey ahead of her. Burnham is a truly fascinating individual. She is the reverse Spock, trying to become more human and less Vulcan. Clearly, seven years on the Shenzou have worked wonders, as Burnham’s actions in the pilot are extremely emotional, including killing someone she really should have captured out of a sense of revenge. She has now heavily contributed to starting a war, and that will surely weigh heavily on her. Hopefully, we have flashbacks with Georgiou to show her evolution pre-series, the way we see Burnham as a child with Sarek in the initial offerings. Despite my complaints about the price of CBS All Access, which I say again, is absolutely ridiculous for a single network and not worth it, I will pay it because they’re holding me hostage with my beloved Star Trek. It makes me hate the network more, but I love Star Trek too much not to subscribe. And STAR TREK: DISCOVERY seems to be the fulfillment of the promise Star Trek always held but often didn’t quite live up to. Until now. So how can I wait a year for the home release, which will likely be cheaper than paying for All Access? Ugh. STAR TREK: DISCOVERY releases Sundays at 8:30 ET on CBS All Access.